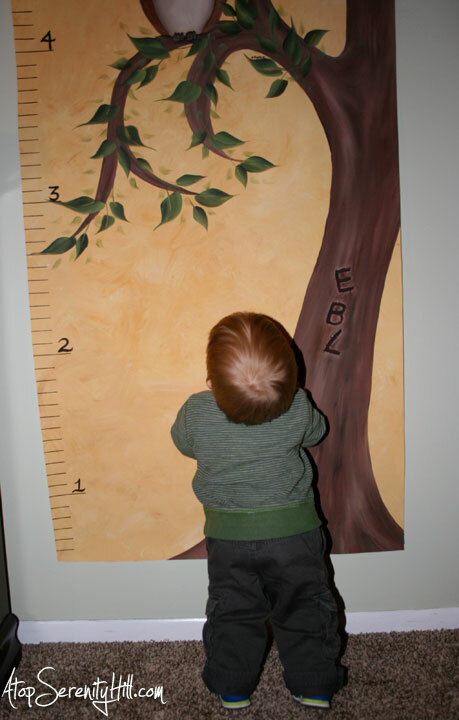 One of my favorite couples asked me to paint a growth chart for their son who had recently turned one. Sarah and I discussed the project with a look to the future. Did she want to be able to save the growth chart for use with a second child or to even hand down to a very future grandchild? 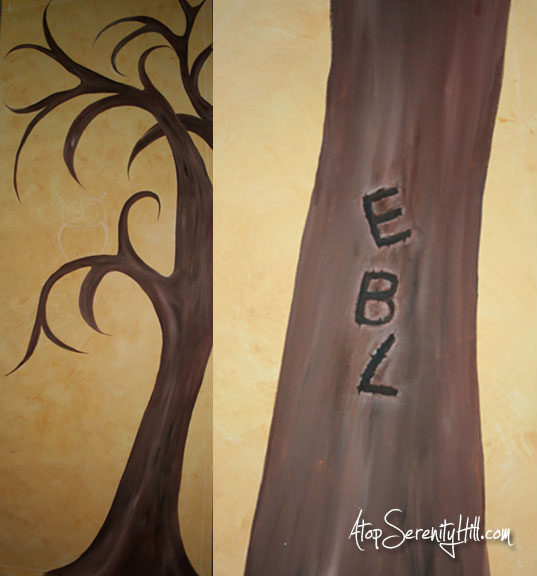 Or did she want it painted directly on the wall and just have it memorialized in photos? She decided that saving it was the best option and so the next question was what material to paint on. 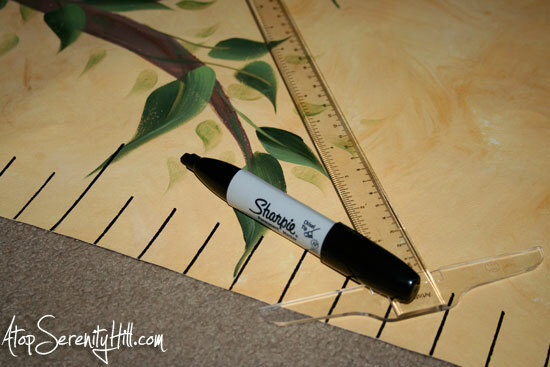 We choose pre-primed canvas that I bought at Blick Art Supply so that she would be able to roll the chart up for easy storage. After cutting the canvas to the size that would work in her son’s bedroom (2.5ft x just over 7ft), I painted the background a mottled golden yellow using a sea sponge and a few different yellows of craft acrylic paint. Staple the canvas to the wall. You could just do the top and bottom and add some decorative molding pieces, or go all the way around with both the staples and the molding. 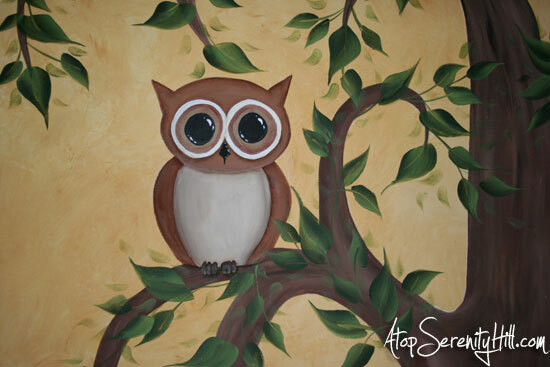 Wallpaper paste can also be used to attach the canvas to the wall. Add grommets to the top and bottom and secure to the wall with cups hooks so that the canvas is taut. 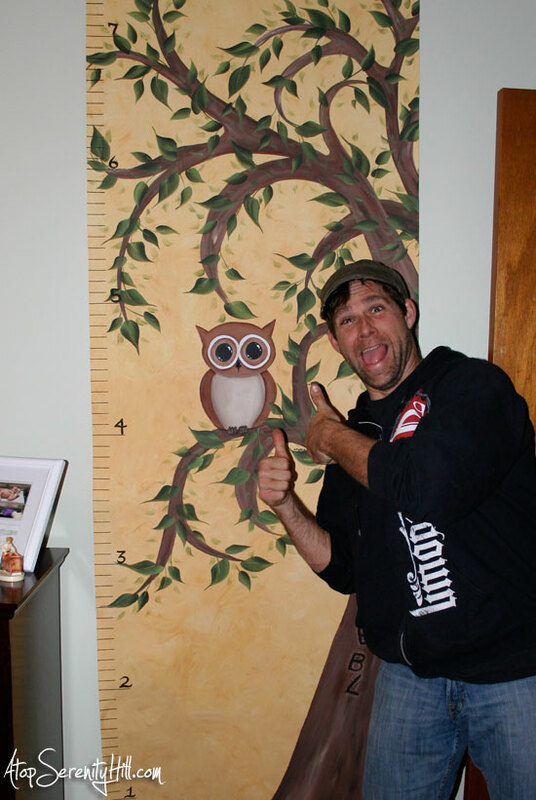 This a great way to add a growth chart to a child’s room and I love that Sarah will be able to keep it for the future. 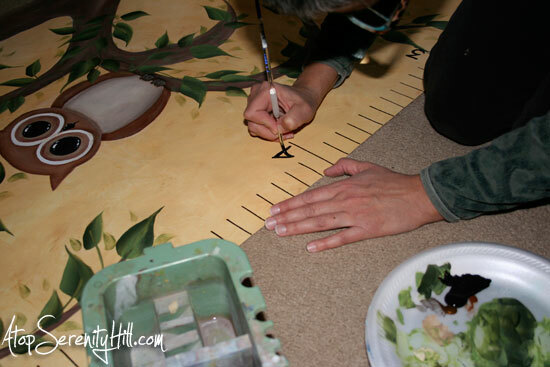 What theme would you use on a growth chart? That’s pretty amazing! The idea in itself is awsome, but your painting really swap my feets away! Most beautiful work of a real talented artist! Thanks for the compliment and for visiting! That is the most loving piece I’ve seen,you are amazng!